Entertainment Weekly revealed on July 12, a brand new picture of Fantastic Beasts: The Crimes of Grindelwald. 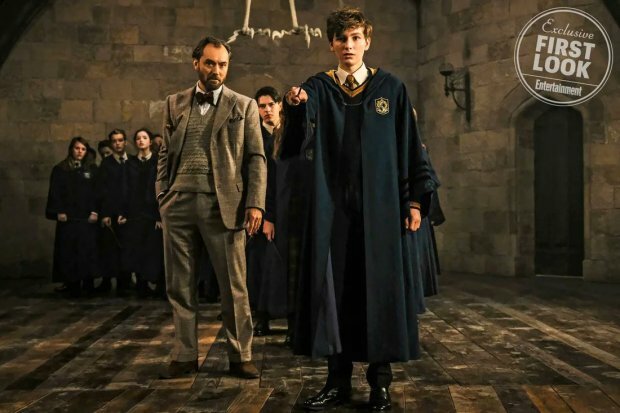 It portrays a flashback at Hogwarts, on which a young version of Newt Scamander, guided by Albus Dumbledore, faces what fans speculate to be a Boggart. The theory comes after a trailer exhibited during a film convention for the press at the end of April. 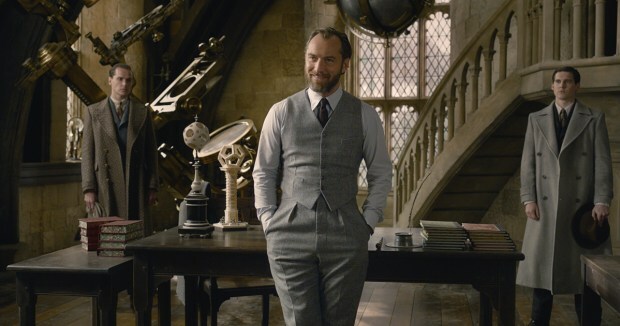 The journalists described that, on one of the scenes, Dumbledore taught the spell Riddikulus to young Newt. Facing the Boggart, the boy encounters a desk: his biggest fear is to work in an office. Written by J.K. Rowling and directed by David Yates, Fantastic Beasts: The Crimes of Grindelwald immerses an increasingly darker era of the Wizarding World. Eddie Redmayne (Newt), Katherine Waterston (Tina), Alison Sudol (Queenie) and Dan Fogler (Jacob) are returning in their roles, as well as Johnny Depp as Gellert Grindelwald, who antagonizes Jude Law’s Albus Dumbledore. The movie premieres November 16th, 2018.